Welcome to the fourth SEPIA newsletter. It’s been another busy year for us, which culminated with a successful return visit to see our friends in Ghana during October/November. This means we have new pictures and stories to share again so here is a summary to bring you up to date. 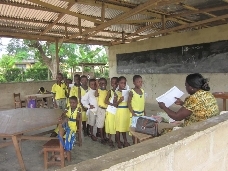 As always we are extremely grateful to our kind supporters who have provided us with the funds to continue our work with an ever increasing number of schools in Ghana. In 2011 we have managed to raise £3948 as a result of a wide range of events. Local schools remain our best supporters and many thanks go to the staff, parents and pupils from Ropley Primary School, Perins School and Oakley Infant School. All three of these schools have been amazing again this year, however, the SEPIA School of the Year Award had to go to Oakley Infants for their marathon fundraising event which brought in over £1000 when the pupils organised and ran the equivalent of a full marathon, 26.2 miles, between them within the school grounds. Having completed the London Marathon myself this year I can fully appreciate what a great achievement this was; especially for children aged 5 and 6! In May I was invited by the ladies of the Alton Inner Wheel to give a talk at their International Luncheon and our thanks go to them for their hospitality, interest and kind donation. On an individual level I would like to thank Babs Bailey who continues to give up her valuable time to make really cute knitted toys which we sell to the pupils at Perins School in the period running up to Easter and Christmas. Thanks must also again go to Lesley Jones who is our first supporter to set up a direct debit payment ensuring that even when we are all too busy to do things some funds are still available for emergencies. It was thanks to this regular payment that we were able to respond instantly to a request for hospital fees for a young Ghanaian pupil this year so if you feel this is something that you could manage please contact us for details. Our SEPIA stall returned to the Alresford Music Festival again this year and we managed to raise £102. I would like to thank the organisers for letting us have a free pitch. It was great fun, in spite of the rain, and thanks go to Aaron and his friends for helping out on the day. Finally I would also like to thank the numerous people who kindly sponsored me to run in the London Marathon. I can honestly say that the only thing that kept me going, especially between 15 and 22 miles, was your promises of sponsorship. As you read below I hope you agree that your generous donations were well spent. Our year started with some unfinished business so the first project was to finish off the primary classroom at New Tafo Methodist School. Whilst much of the building had been completed and was already in use (see Newsletter 3) we did have a few outstanding bills to pay for. With inflation currently running at about 12% in Ghana it is important to keep on top of the costs. In February we received an emergency call from one school in New Tafo requesting help for a pupil who had suffered a horrendous accident and required immediate hospital treatment. His family were unable to pay for the treatment needed and even though his teachers had given the family money to get him some basic treatment the boy, Appiah, needed two complicated operations. Thanks to one kind supporter and their monthly direct debit we were in a position to transfer enough funds to pay for the initial operation immediately. Whilst this was taking place I decided to dedicate my marathon run to setting up a medical fund and thanks to the great response from you all by April we were able to send out the money to cover the second operation and his stay in hospital. 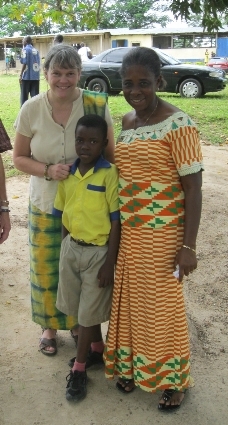 In October we met up with Appiah and I am pleased to say that he is happy, healthy and back in school. So thanks again from us, Appiah and his family. Many charities run pupil sponsorship schemes to help with educational needs but we have decided to continue with our bursary scheme for 2011. Much of our work is based upon giving people the tools to do the job rather than offering long term support and although, as with bursaries, the help may be financial it is given to enable the student to achieve a particular goal. We have awarded two bursaries this year; one to help Seth pay for his Secondary school fees, equivalent to our 6th form, and one for Samuel to help him buy a computer to assist with his ICT training course. Each year we review our work to ensure that your money is being used in the most effective way. We largely rely on the teaching staff in the Ghanaian schools we work with to guide us but we also like to ask donors for suggestions. In February I returned to Ropley School to speak with the pupils about our work and asked them for their suggestions. I was slightly surprised when they asked if we could use the money they had raised, nearly £400, to buy a laptop. In my mind I had already consider a few ways to use their money but this was not one of them. My ideas were more basic, classroom equipment such as pens, books etc. or maybe some classroom furniture; however, the pupils argued that they would like to use it for something special, something which the Ghanaian pupils would be excited about. I shared this idea with some friends in Ghana and I quickly discovered that this was seen to be a brilliant suggestion. Lots of e mails, phone calls and discussions later I had expanded upon their idea and through working with a company called ‘Computers 4 Africa’ arranged for a container of 220 refurbished computers to be shipped to Ghana. This included several laptops paid for by the pupils at Ropley. 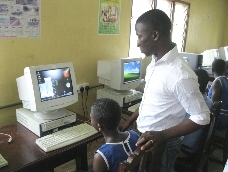 Computers had always been high on the ‘wish list’ but it had remained a wish; now, thanks to the pupils and staff at Ropley, it is a reality. 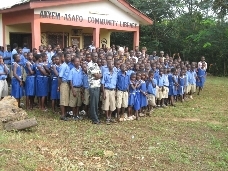 In October the computers and laptops arrived in Ghana and after a bit of negotiation with the port authorities they have now been distributed to 10 different schools within the New Tafo area. Having recently returned from these schools I can confirm that the pupils were very excited about this. How did we pay for this? A good question, well £1620 came from SEPIA, some came from the schools in Ghana through their own fund-raising and some came from Helen and I. This turned out to be our most expensive project to date but if you could have witnessed the amazing reception we received when visiting the schools you would realise that it was a small price to pay. Our website has been up and running for a while now and I hope you have had a chance to look at it. Hosted for free by Helen’s brother, Michael Matthews, and built and run by Aaron’s friend, Lewis Desforges, it’s a good way to keep up to date with our work. This is also an easy way to donate to SEPIA. Our payments are processed by Charity Choice for free and they will also allow you to complete a Gift Aid section too. Even though we do not earn enough to be recognised by the Charity Commission the tax office recognise us for gift aid purposes, so feel free to use this facility! Thank you to those who are now doing their internet shopping though the SEPIA Easy fundraising account, which has now raised just over £50. If you have yet to use it, click here - http://www.easyfundraising.org.uk/ You will have to set up your own account, choose SEPIA as your charity and then, if you want to buy something from Amazon or M & S or hundreds of other well-known suppliers, just make sure you access their website via your sepia.easyfundraising account. It’s all free and it raises money, so try it out at Christmas! Finally, Helen, Aaron and I would like to wish you all a Merry Christmas and we look forward to sharing more information with you in 2012. 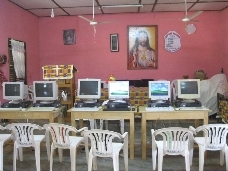 The new computers are installed in the community library so that more than one school can use them.